Composer Richard Rodgers had wanted to adapt a rural folk drama of the 1930s — “Green Grow the Lilacs” — to the musical stage and felicitously, lyricist Oscar Hammerstein II, who also admired the play, accepted Rodgers’ proposition to collaborate. By the spring of 1942, they were officially partners. From the beginning, their collaboration was going to be different: Hammerstein would write the lyrics first and Rodgers would set them to music. And both collaborators were determined to put the narrative of the story and the journeys of their characters before any concessions to musical comedy conventions. Aided by the brilliant choreography of Agnes de Mille, their simple tale of cowhands and farmers finding love and community in the Oklahoma territory caught the imagination and patriotic passion of wartime America. Laurey, a spunky girl who runs her aunt’s farm, is courted by two very different young men: Curly, an brash cowhand, and Jud, a surly, pathological farmhand. Her journey to find the man of her dreams and the satisfaction of settling down with the right one (it’s Curly, if you hadn’t guessed) underscores the journey of the territory toward progress, community, and statehood. 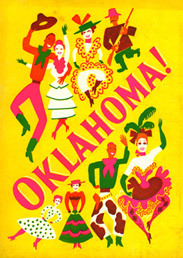 In the decade before “Oklahoma!” opened, not a single hit show ran over 500 performances; “Oklahoma!” ran for 2,212. Even the songs, which Rodgers and Hammerstein worked so hard to keep within the context of the setting, broke out to achieve extraordinary popularity; the self-defensive love song “People Will Say We’re in Love” was a number-one song in 1943 and “Oh, What a Beautiful Mornin'” and “The Surrey with the Fringe on Top” also topped the charts. “Oklahoma!” was more than a hit — it was the first real phenomenon in modern Broadway history.